The Rockland Matsubayashi-Ryu Dojo was founded in January, 2006 to bring Matsubayashi Shorin-Ryu karatedo to midcoast Maine. The dojo operates out of the Penpbscot Bay YMCA, in Rockport, Maine. There are three classes weekly open to all students and one black belt class. Classes are held Tuesdays and Thursdays from 7 - 8:30 p.m. and Saturdays from 10:30 am - 12 pm. The black belt class is by invitation only and is held at 2 pm on Sunday afternoons..
All classes are included in the Penobscot Bay YMCA membership. Our classes are intense and will improve your endurance both mentally and physically. We practice kata and kumite (sparring), applications, and basics while improving our stretching, strength and general health. If you are thinking of learning the art of Karate-do while strengthening your body and mind, email us or give us a call. 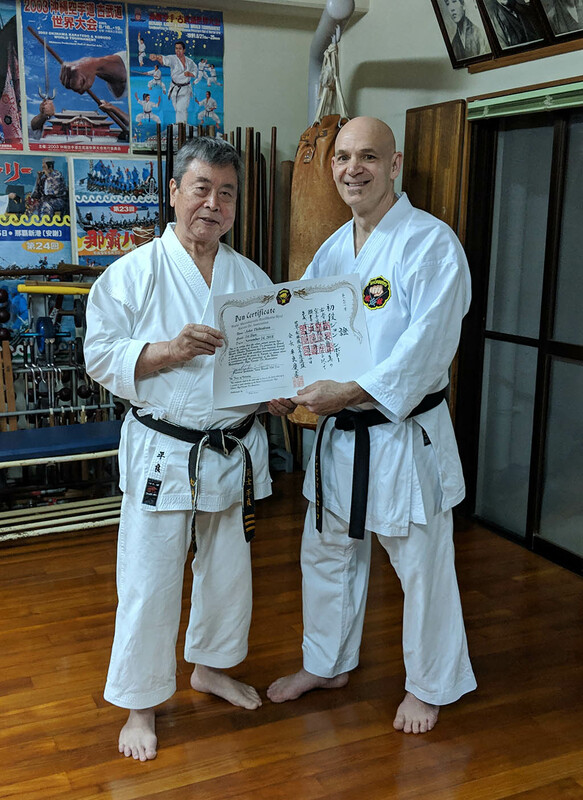 Sensei David Troup received his 4th dan from Sensei Max Crevani, Kyoshi, 8th dan, after receiving his 1st, 2nd and 3rd dan from the late Soke Takayoshi Nagamine (1945 – 2012), 10th Dan Hanshisei, who was the son of Matsubayashi-ryu’s founder—Grandmaster Shoshin Nagamine. Originally from NYC, Sensei Troup grew up in Italy and France and returned to the United States in 1979. He trained from 1987 through 2005 under Sensei Owen Masters, 6th Dan in Matsubayashi Shorin-Ryu and also Sensei Max Crevani, Kyoshi, 8th Dan in Matsubayashi Shorin-Ryu at the Shorin-Ji Bushido in New York City. Both Senseis Masters and Crevani were trained by Sensei Zenko Heshiki, Kyoshi, who had been a student of the late founder of Matsubayashi Shorin-Ryu, Grandmaster Shoshin Nagamine. He moved to Rockland, Maine in 2005 with his wife Hanna who grew up in nearby Camden. He continues his own training in Okinawa with Sensei Toshimitsu Arakaki, Hanshi, 10th Dan, Vice President of the WMKA. 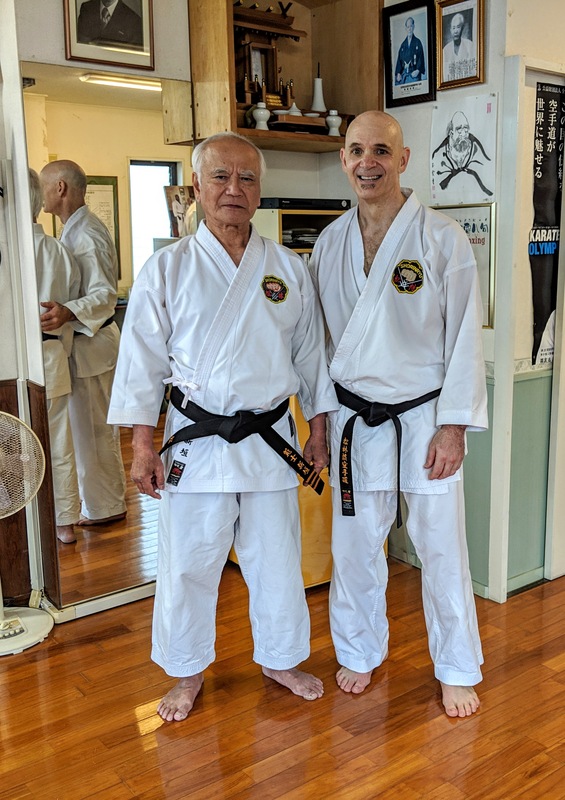 On his recent trip to Okinawa in March 2019, he trained with Sensei Arakaki and with WMKA President Yoshitaka Taira, Hanshi, 10th Dan; Sensei Iwao Tome, Hanshi, 9th Dan; Sensei Masao Shinzato, Kyoshi, 8th Dan; Sensei Tsugio Miyagi, Kyoshi, 8th Dan; and Sensei Tetsuo Makishi, Renshi, 6th dan.